We work in biomedicine focussed on the toxicological, pharmacokinetic and functional evaluation of composites (including nanocomposites), for which we hold the GLP (Good Laboratory Practices) standard recognition certificate. 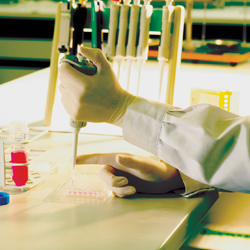 We are experts in biodetection applied to the development of biodiagnostics for human, animal and environmental health. We select and develop highly specific and sensitive biorecognition molecules and optimise their immobilisation in the biosensor system. Lastly, we also work in industrial biotechnology focussed on improving industrial processes by means of selecting and producing microorganisms and/or enzymes with specific activities. This activity lends support to the pharmaceutical, cosmetics, agrifood, diagnostics and chemical sectors, etc., based on knowledge of microbiology, genetics, cell biology, biochemistry, immunochemistry, molecular biology, proteomics and genomics.